Vicky Bosworth joined the Clover Foundation Board in 2009 to continue the early work her mother, Jane Garrod (Clover Foundation Founder), did in the 1970s to ensure a future with agricultural science education and exhibition for youth enrolled in 4-H and FFA programs in Santa Clara County. Vicky was a 4-H member for 10 years, a leader for 28 years, and remains active in the California State 4-H organization. She continues to work on the Garrod Family Farm with youth and adults, teaching confidence and leadership from the back of a horse. Vicky stays involved with the Clover Foundation to continue the rich agricultural heritage tradition and history of Santa Clara County. Timothy Dylan Wood joined the Clover Foundation Board in 2017 to assist with community outreach and support the Foundation’s programs to foster socio-economic diversity and greater access to agricultural education. He has been realizing his commitment to youth education by serving as a trustee on the Board of Mulberry School in Los Gatos as well as a youth projects committee member for the Friends of Deer Hollow Farm. He, his wife, and their three children have become fully immersed in the Rolling Hills 4-H programs—raising rabbits, poultry, goats, and swine. Timothy grew up amongst the apricot orchards of the Santa Clara Valley foothills. He received his PhD in Cultural Anthology from Rice University, after many years of fieldwork in rural Cambodia. He has been a livestock volunteer at Deer Hollow Farm for over a decade, and he spends long days in the Sensor Software & Prototyping group at a small fruit company based in Cupertino. Email Timothy Dylan Wood, Ph.D.
Regina Matthews just joined the Clover Foundation Board in August 2018! We will update her Biography Shortly. Mary Bartlett joined the Clover Foundation Board in 2008 to help provide scholarships and loans for youth in agricultural science livestock programs. She is a member of the Santa Clara County Fair Management Committee, and has been active with her family in 4-H for 26 years. She is a 4-H Ceramics project leader, a Volunteer Certification leader, ranch manager to Homesteaders and McClellan 4-H ranches, and serves as an Emerald Star Advisor. Mary retired after 34 years of teaching for the San Jose Unified School District. She enjoys skiing, gardening, kayaking, and raising chickens. Mary currently serves as a Director of the Fairgrounds Management Corporations (FMC); appointed by the Santa Clara County Supervisors. Lisa Toensfeldt joined The Clover Foundation in 2015 and currently serves as Secretary. At the age of 9 Lisa was recruited to Rolling Hills of Cupertino 4-H by some Girl Scout defectors in her neighborhood. During her 10 years as a RH4H member, she spent 6 summers showing lambs, hogs, and steers at the Santa Clara County Fair, raised a goat for Heifer Project International, and showed 2 hogs at the Junior Grand National. Her SCC Fair entries also included sewing, food preservation, and photography projects. While in high school, Lisa was awarded a trip to the National 4-H Congress when her record book was selected California State Winner in Home Management. Today Lisa works as an operations manager for a high tech Fortune 500 company based in Silicon Valley. Kathryn Green just joined the Clover Foundation Board in August 2018! We will update her Biography Shortly. Hans Toensfeldt joined the Clover Foundation Board in 2006 and is currently its Treasurer. He supports the foundation to help infuse leadership development opportunities into 4-H and FFA youth programs. He brings 39 years of 4-H expertise to the team, as a 4-H leader, helping his late wife Lonnie, establish a Cupertino 4-H urban farm site in 1974, and as a parent of 3 daughters who were active in 4-H and the Santa Clara County Youth Fair. At present, Hans is very active in 4-H as County Treasurer, Emerald Star Advisor, Master Volunteer for the fair, and he recently returned to the Cupertino 4-H farm as Manager. David Peck is serving as president and joined the Clover Foundation Board in 1988 to support the early work his Mother, Ruth Peck (Clover Foundation Founder) did and assure the spirit of the founding members and leaders who launched the Clover Foundation 30+ years ago continues. David enjoys giving back to local youth in thanks for the support he received during 9 years in 4-H as a member of the Foothill Club, as a livestock exhibitor at the Santa Clara County Fair, and as a 4-H Diamond Star. David is active with his family, and serves as a board President of the Fairground Heritage Foundation of Santa Clara Country and is a member for the SJA Water Polo Club in the Almaden area. Dave Duarte joined the Clover Foundation Board in 2007. He attended Cal Poly, San Luis Obispo, and teaches Agricultural Science and Mechanics at Westmont High School. 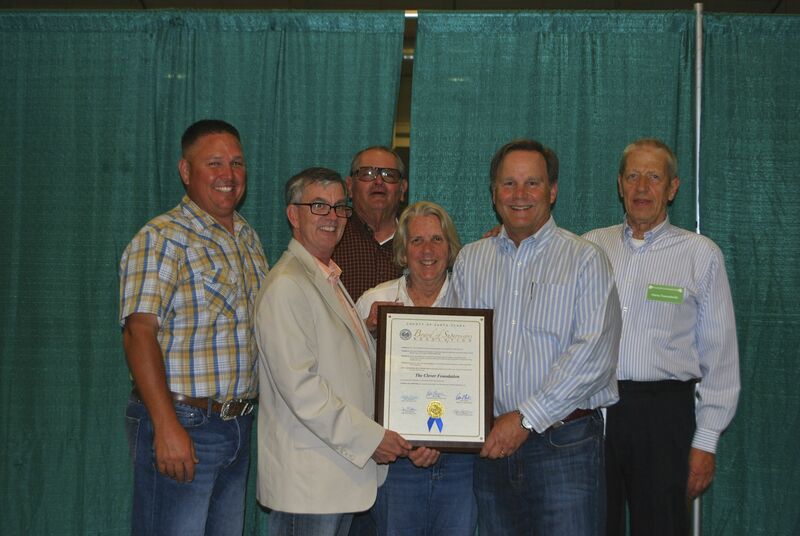 Dave has volunteered for 19 years with 4-H, FFA, and the Santa Clara County Youth Fair. He was in 4-H for 10 years, and his wife Salene is currently a 4-H club leader. In his spare time, Dave is active with his family, runs two small businesses, keeps busy with cattle ranching and showing cattle, and serves on several community foundations to support youth leadership development and agricultural awareness. Colleen Haggerty joined the Clover Foundation in 1996 to support youth agricultural science education, to continue to tradition of livestock exhibition, and to encourage youth leadership and project management skill development in the 4-H and FFA programs. She was in 4-H for 5 years, and has been an active 4-H volunteer for 20+ years. She is active with her family, and enjoys spending time with her daughter making jewelry and doing home craft projects. Colleen is a Civil Engineer with Santa Clara Valley Water District, and also serves on the board of her daughter’s school Parent-Teacher Organization.